Swim, sip and soak up the sun in the British Virgin Islands on a half-day rum tasting and snorkel tour on Tortola. Take in views of bays and beaches from a ridge road through the heart of the island and visit one of the British Virgin Islands’ oldest rum distilleries. Sample local spirits in the distillery’s historic tasting room, then find the perfect stretch of sand at Smuggler’s Cove Beach, where you’ll swim above a thriving coral reef system, spot brilliant fishes and discover the Caribbean's fascinating marine life. Meet your guide and group at the ferry dock, climb in to a comfortable vehicle and drive along Ridge Road. 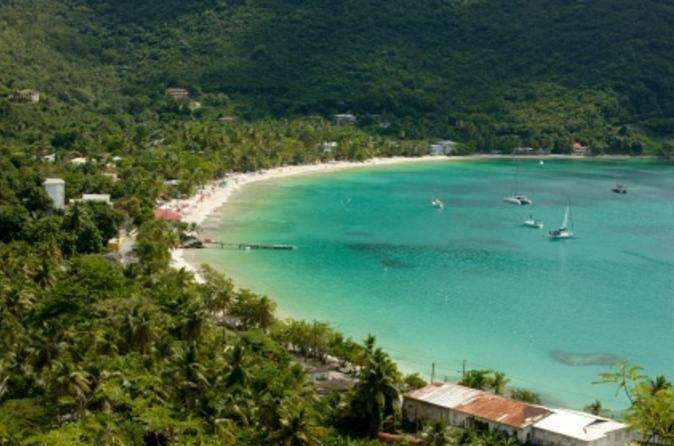 Enjoy panoramic views of the northern side of Tortola, which is just 14 miles (23 km) long in total. Stop for photo ops of the sparkling blue Caribbean at a scenic lookout before proceeding with your rum tasting. Arrive at Callwood Rum Distillery, one of only 2 rum distilleries in the BVI, for your rum tasting. Have a look around the historic brick and stone architecture, then relax and sip a variety of rums made there. Continue to Smuggler's Cove Beach, the launch point for your snorkeling excursion. Slip on your snorkeling gear and wade right off the beach into the azure waters. Immerse yourself in the underwater world, bustling with vibrant coral and schools of brightly colored fish. When you've had your fill, climb back up on the white sand beach for some relaxation.